Say goodbye to paper menus and inaccurate payments. 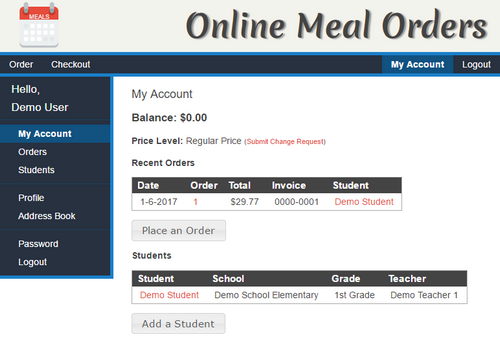 Mealsite is a dedicated online ordering system for school lunch programs. Parents or students order conveniently with a smartphone or desktop computer for one day or an entire month. Offer more choices, prepare only what is needed, and save money. 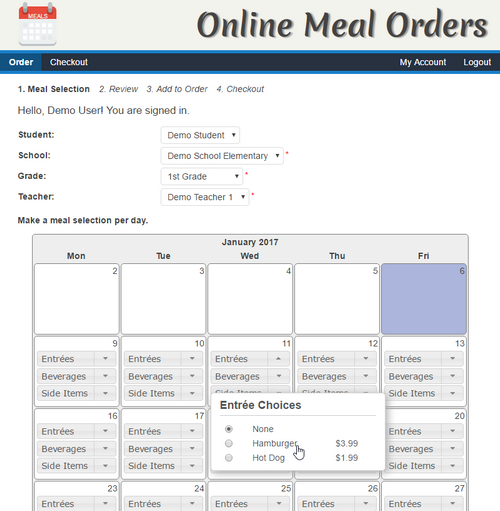 Mealsite delivers a turn-key school lunch ordering solution that allows you to accept web orders for school lunches at a fixed monthly cost per school. Parents, students, and faculty place orders and pay online at their convenience. Your lunch website will generate daily reports to know how many meals to prepare and who they are for. With Mealsite you are in full control of the customer experience. You can setup your menu to allow advance orders as far as your menu is planned. You can also set a cut-off time for orders such as the day before by 10 PM or same day by 8 AM. Everything is configurable to make the order system match your existing lunch program exactly and offer more flexibility than other school cafeteria software. Competitive Advantage - When bidding or competing for contracts with local businesses, you will be able to offer the convenience, organization, and reporting features of an online ordering system. Supply Purchases - Take the guesswork out of stocking food supplies. Use the reports from your meal website to see the demand for your menu offerings. Lunch preorders mean less waste in the kitchen! Business Cash Flow - Being paid in advance for meals creates a positive cashflow, allowing you to purchase food supplies from cash on hand. Customer Convenience - Parents can order in advance daily, weekly, monthly, or even further depending on how early you make your lunch menus available. More Consumer Choice - Our interactive, calendar-based menu system allows you to specify meal, drink, and additional choices for each day. This is fully customizable by the operations team. Thanks to accurate reporting of meal orders you will be able to easily expand the choices available if you choose to do so. Intuitive calendar based ordering. Accept orders months in advance or even up to an hour before. You are in control. Service one school or an entire district. Perfect for public or private schools, food vendors, and catering services large or small. Rapid meal input methods with detailed reports. Create an organized flow to stock, prepare, and serve quality meals to your clients. Mealsite has a comprehensive set of features to help your business focus on food delivery. Here are some of the highlights. Configure product types and reusable product templates, which then are added to menus with one step any time you want to offer it. Display the logo for your school or catering service at the top of your lunch order website. You can even use a custom domain! Per-grade or per-group menus. For example, Pre-K and 1st grade may have different choices, portions, or prices than 2nd-5th grade with only two menus. A single meal site is all that's needed for one school or an entire school district. Students on the free and reduced lunch program can place their own orders. Knowing how many servings of food to prepare can significantly cut down on wasted food. The calendar order form makes it easy for parents to decide what days lunch is needed. Parents of children attending different schools listed in your Mealsite can checkout with a single transaction. Place your order from home or the carpool line with the same easy user experience. Parents may preconfigure their students and billing info to allow faster ordering and view order history. Accounts are encouraged, but customers do not have to create an account to place an order.